Paul and Linda McCartney Wings Tour 1975. 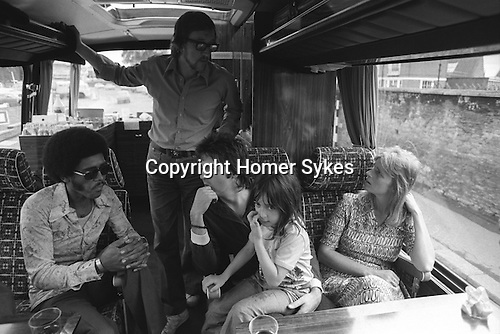 Paul and Linda on the tour bus with their daughter Mary McCartney on Paul's knee. Paul is talking to a member of the backing group brass section. Linda is talking to manager Alan Crowther. England. The photographs from this set were taken in 1975. I was on tour with them for a children’s "Fact Book”. This book was called, The Facts about a Pop Group Featuring Wings. Introduced by Paul McCartney, published by G.Whizzard. They had recently recorded albums, Wildlife, Red Rose Speedway, Band on the Run and Venus and Mars. I believe it was the English leg of Wings Over the World tour. But as I recall they were promoting, Band on the Run and Venus and Mars in particular.